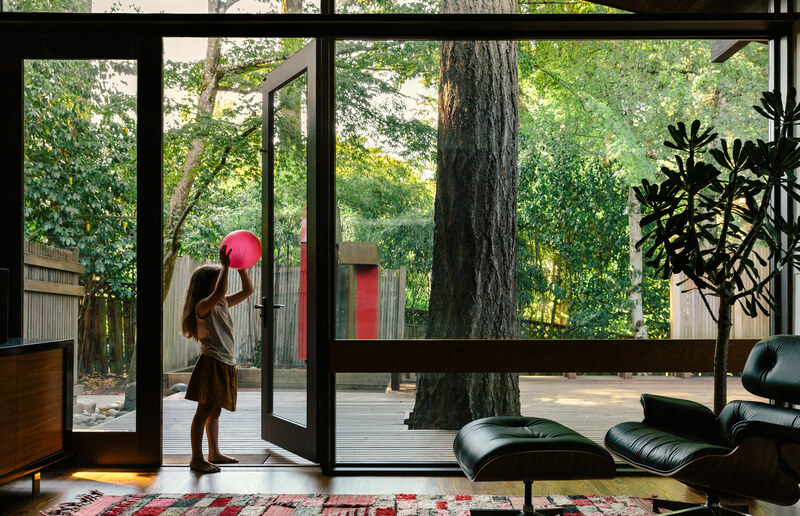 In the living room of this renovated 1959 modern gem in Portland, an Eames lounge chair and ottoman sit on a Moroccan rug from M.Montague. Throughout the house, Kolbe windows and fixed glass (in existing jambs) were added to increase energy efficiency. In Florida, one couple built a new house inspired by the Sarasota School, without sacrificing quintessentially modern expanses of glass. Today’s FEMA codes required a plinth to lift the house five-and-a-half feet above grade and a roof that can withstand hurricane wind loads, making it a challenge to re-create the lightness of midcentury design. In an industrial stretch of Chicago, a couple used commercial solutions to save money on their massive live/work space. The floors are polished concrete, a money-saving move that allowed for splurges like the floor-to-ceiling windows from Chicago Tempered Glass set in Tubelite frames. A glazed window wall breaks up the rhythm of the stucco exterior in this energy-efficient Palm Springs prefab. An overhang extends 20 feet to protect the glass from solar gain. In a salvaged 1880s barn, double-height glazing lets in views of the Driftless region of Wisconsin. Even with the all the glass, the structure remains energy efficient—with an assist from a grid-tied solar photovoltaic array.